For 14 gifted science students from around the state, Friday marked the completion of eight weeks of in-depth research at OMRF. 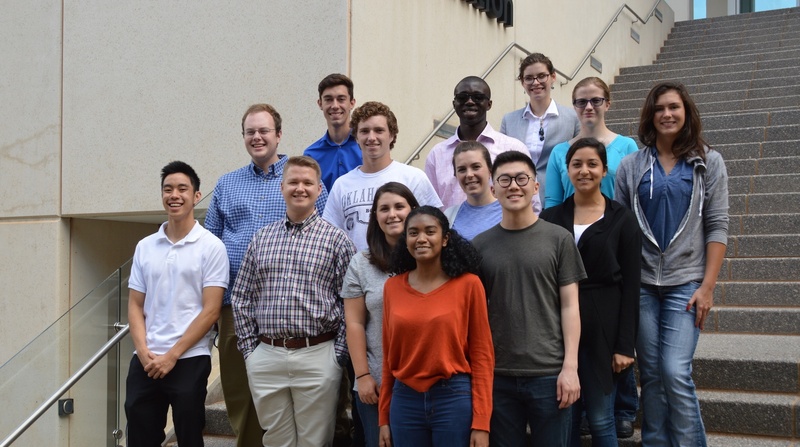 These students took part in OMRF’s prestigious Sir Alexander Fleming Scholar Program where they were given the unique opportunity to work side-by-side with senior-level researchers at the biomedical nonprofit research facility. As Fleming scholars, these students took part in hands-on, individual research projects studying everything from age-related muscle loss called sarcopenia, to how understanding blood cells called platelets can help advance treatments for cardiovascular disease, to in-depth projects on autoimmune disease like lupus, multiple sclerosis, rheumatoid arthritis and inflammatory bowel disease. In addition to working in the lab, Fleming Scholars attended lectures by OMRF scientists to learn about diverse research projects and science-related career options. They attended social events and spent time as a group outside the lab. At the end of the summer, scholars made formal presentations outlining their individual research results to OMRF’s scientific staff. Moore native and Oklahoma School of Science and Mathematics graduate Keirah Jefferson said completing the project and giving a presentation is a challenge in such a short window of time, but it taught her to appreciate the challenges scientists face regularly. Founded in 1956, the Fleming Scholar Program has provided advanced science training to more than 500 Oklahoma high school and college students. Named for Sir Alexander Fleming, the Nobel Prize-winning scientist who discovered penicillin and in 1949 dedicated OMRF’s first building, the one-of-a-kind program annually attracts up to 100 applicants. Two current OMRF senior scientists, Judith James, M.D., Ph.D., and Rodger McEver, M.D., started their research careers as Fleming Scholars. James is the Program Chair OMRF’s Arthritis & Clinical Immunology Program, the foundation’s largest program, and McEver is the foundation’s Vice President of Research.